This sentence (underlined) was in a film, a song, a play, and a short story. But where did it actually come from? And what was it, originally? McMurtry not only recalled the line differently, but also gave it a different meaning by writing “choose between”, implying a choice between two related concepts. However, his version fits what he did in the novel – which was to depict, and print, the legend of Wyatt Earp, not the real-life Wyatt Earp. Also, it was not John Ford who said it. 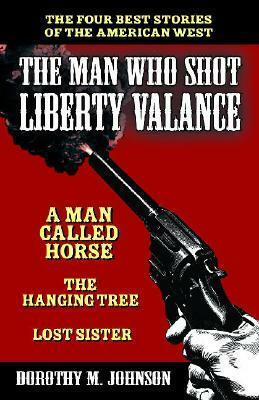 It was the screenplay writers who wrote the lines for the actor who played the part of the reporter, “Maxwell Scott”, in the 1962 film, The Man Who Shot Liberty Valance, which was directed by John Ford. There’s a mouthful – but that’s not all of it. “Ransom Stoddard: You’re not going to use the story, Mr. Scott? In other words, when fiction becomes fact, print the fiction. A legend is folklore – or an old, made-up story – that people eventually believe took place in history and is true, because it sounds so convincing and humanistic. In the film, Maxwell Scott firmly chose legend over fact because legends sold more newspapers in the Wild West. 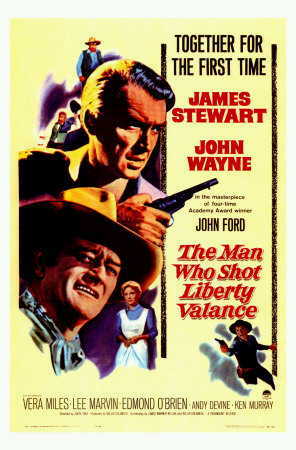 The film poster of The Man Who Shot Liberty Valance, starring Spencer Tracey and John Wayne, and directed by John Ford. They created a great exit line for the context that they had created in the film. The reporter, Maxwell Scott (played by Carleton Young), gets the facts about the celebrated career of “Ransom Stoddard” (played by James Stewart ) a senator who, in his youth, became famous for killing an outlaw, “Liberty Valance”. Having listened to the roll-call of the senator’s achievements in politics and the law, which is much duller than the public gossip doing the rounds, Scott realizes that Stoddard’s entire reputation is based on the myth that he killed Valance. And he rips up his notes and says the famous line. Newspapers of the time contained sensationalist stories with blaring headlines. This sort of “Yellow Journalism” – the forerunner of today’s tabloids – was backed up by exaggerated and frankly fantastical “dime novels” about the “Wild West” that became hugely popular after 1859. What the public demanded, the public got. And what they got, they believed. It also reflects the cynicism of the writers and their belief that in news publishing, the legend (a juicy bit of fiction that the public believes) is more acceptable than history (or the facts.) It was certainly true about Hollywood in those days, where the PR machines of the big movie studios churned out endless lies and legends about movie stars. When he wrote it like that – when fact becomes fiction, print the fiction – he got it backwards. It’s the opposite of the meaning of the original line. These days, the line is misquoted even more by people just saying; “print the legend”. It is a sort of rallying cry showing support for “poetic licence” and freedom of expression, or alternatively, support for the publishing of news purely for profit and for entertainment, under the banner of “press freedom”. Apparently, way back in 1983 the line became a trope (a universal, omnipresent storytelling device or convention, a shortcut for describing situations the storyteller can reasonably assume the audience will recognize.) Specifically, it is a “ret con” trope, or Retroactive Continuity, which means it is used to reframe past events to serve a current plot need. The screenplay writers added in the line – one of many – to build the film plot, and they reframed the context, and this process has subsequently happened many times to suit people’s changing perceptions of the law and press freedom – and fake news. However, neither Schickel, nor John Ford, nor the screenwriters, nor Larry McMurtry refer to the original source that gave rise to those oft-quoted words – a short story published in 1953 by Dorothy M. Johnson, called The Man Who Shot Liberty Valance. And, note: those lines are not in the book. In fact that scene is not in the book, which is why I credit James Warner Bellah and Willis Goldbeck, not Dorothy Johnson. While the film is a Western crossed with a legal drama, the short story is a legal drama crossed with a coming-of-age theme. What stands out in it is the Shakespearian poetry that “Senator Ransome Foster” (note the similarity in the name) quotes – which is rather unusual for a ranch-hand and general labourer. Ransome Foster is anything but senatorial in his youth – he is poor, proud, mean and vengeful. The story is really short, a light little thing, not much at all. Certainly not enough to make a sweeping Western drama with the themes of truth, justice and the pursuit of liberty out of it, which would explain why the screenwriters had to pad it out with ret cons. “That book you read,” she asked wistfully, “what’s it about?” “It was written by a man named Plato,” Ranse told her stiffly. “It was written in Greek.” She brought him a cup of coffee, hesitated for a moment, and then asked, “You can read and write American, too, can’t you?” “English, Miss Hattie,” he corrected. “English is our mother tongue. I am quite familiar with English.” She put her red hands on the cafe counter. “Mr. Foster,” she whispered, “will you teach me to read?” He was too startled to think of an answer she could not defeat. “Bert wouldn’t like it,” he said. “You’re a grown woman besides. It wouldn’t look right for you to be learning to read now.” She shook her head. “I can’t learn any younger.” She sighed. “I always wanted to know how to read and write.” She walked away toward the kitchen, and Ranse Foster was struck with an emotion he knew he could not afford. He was swept with pity. He called her back. “Miss Hattie. Not you alone—people would talk about you. But if you brought Bert—“ “Bert can already read some. He don’t care about it. But there’s some kids in town.” Her face was so lighted that Ranse looked away. He still tried to escape. “Won’t you be ashamed, learning with children?” “Why, I’ll be proud to learn any way at all,” she said. Ransome/Ransom/Ranse had “forgotten the lines”, like the playwright, the screenplay writers, the journalist and the novelist, and many others have done. And that’s why everyone thinks that John Ford uttered them. Maybe he did, in interviews and while they were filming. But he sure never wrote them. And he sure never thought them up. About the header: Whose lines are on the gravestone? Photo by J.v.d.V. Le Roux, taken c. 1980, of the family graveyard on the farm of one of the family’s ancestors, in Namaqualand, on the west coast of South Africa.